The BAC held its bimonthly meeting on Jan. 9. The meeting focused on discussion with MPD Assistant Chief Jeffery Carroll, pictured at left. The BAC also elected new officers. Ward 6 member David Cranor chose not to run for another term as chair. The new leadership includes Chair Rachel Maisler, Chair Pro-tem Tom Bridge, and Secretary-Treasurer Jeff Johnson. Emily Curley was appointed to the Ward 3 seat. In the field, members attended community meetings about infrastructure projects. 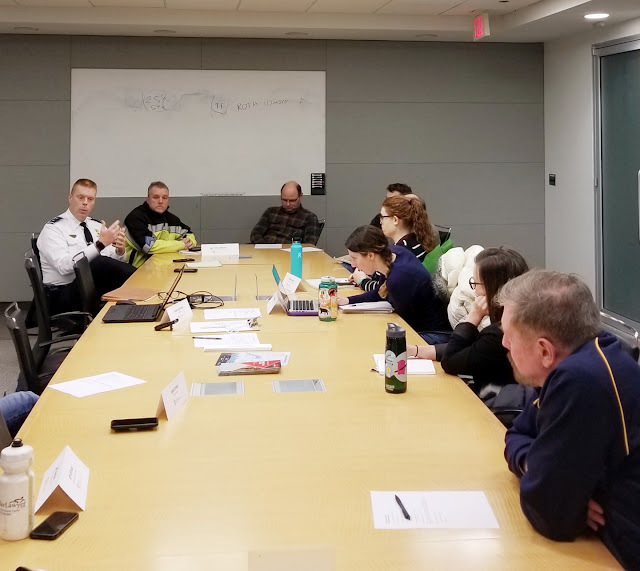 At least two members are visible in the picture below, taken at a December public meeting about the 20th/21st/22nd Streets NW protected bike lanes project. Members Jeff Johnson (left) and David Alexander (third from left) reviewed the options for new bike lanes. Note that DDOT is accepting public comment through Feb. 13, 2019. The BAC previously surveyed the area and issued its recommendation last summer. The meeting will feature discussion with the Department of Public Works. The meeting will review bike lane projects and develop plans for spring and summer rides. The meeting will review upcoming legislation and elect a 2019 chair. Save the date for the next full BAC meeting on March 6 at 6 p.m. at 441 4th St NW.